It’s been a busy few weeks since we commenced the new year. 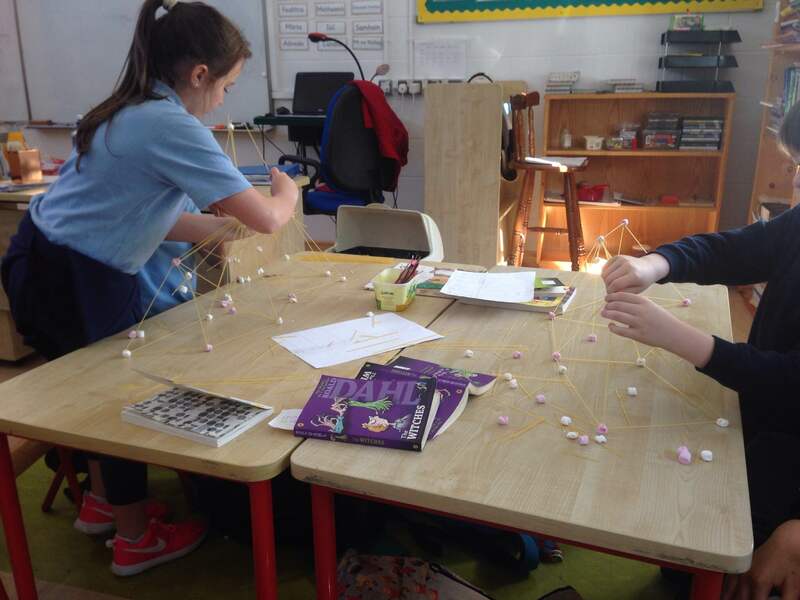 Fourth and 5th class have been learning all about Maori history, writing articles and how to construct the highest tower possible using paper cups. From communications, science, engineering and history – we have it covered! Check out the pictures in the slideshow below to view our journey. STEM Discovery Week 2018 was a joint international initiative that invites projects, organisations and schools across Europe and around the world, to celebrate careers and studies in the fields of Science, Technology, Engineering and Mathematics (STEM). The tagline for the 2018 campaign “say yes to STEM” described the partners’ open-minded and dedicated support to STEM subjects at school, as well as wide-ranging collaboration among stakeholders in the area. 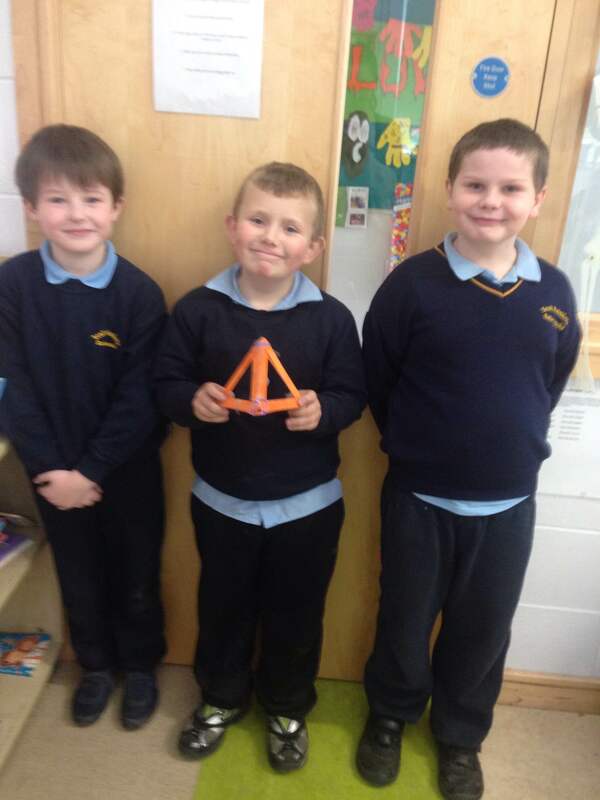 Mr Comer’s 4th & 5th class students were set the challenge to design a catapult, pully and paper airplane. It was a fun way to get children involved in STEM subjects. The U 13’s team receiving their prizes. A great achievement and reward for all their hard work! The U 11’s team enjoying the table quiz. Thank you to Mr.Corcoran for organising the lunch time school competition in order to choose the pupils who qualified to compete, to Cecil Whelan for coaching us voluntarily, to C.L.T.C. for providing a coaching venue, to the pupils who refereed the matches, and of course to parents who drove children to both training and the competition itself. Well done to those who participated at such a high standard, having never played before and with great success! Congrats to Abbie Byrne who won our school spelling bee and competed in the regional competition. Can you spell pandemonium? Our class being photographed at the grand opening of “The Core” centre. Congratulations to everyone who was involved in establishing what promises to be a great resource for the community. Shared reading with Ms.Howard’s class. We say “NO” to bullying and learn the skills that equip us to deal with difficult situations. This week we participated in a two day enterprise and business development workshop. We worked in small teams and took on roles of Directors in a company. We were jointly responsible for coming up with new products and services. We had to communicate our businesses’ benefits and acquire investment in order to develop and market them. Students took into account marketing costs and companies tracked their finances (currency=BizBucks). Students designed posters to advertise their businesses. Students designed logos, slogans and business cards. Each company presented their Pitch and marketing materials to the Dragons at the end of the workshop. They drove a hard bargain. The class receiving their BizWorld certificates. Members of “Rollog” who earned the largest number of BizBucks in return for 15% of their company! Rio De Janeiro is by the sea. Zoo with monkeys and bullfrogs too. On both sides of the Thames. Now it’s time to explore and eat. A huge thank you to Santa for visiting us and giving us selection boxes when it is such a busy time of year for him. There was great excitement in the school when he arrived on the fire engine! We visited County Carlow Library as part of Carlow Arts Week. We met Caroline Bush, an author who just released her new book “The Ghosts of Magnificent Children.” There we learned all about Victorian times and took part in a Creative Writing Workshop. Our name projects are a representation of who we are. Can you guess who owns which? Ever wondered why people and things float better in the Dead Sea? The secret is in the salt… and lots of it. This month we learned about Australia. We created artwork using techniques which are used by Australia’s indigenous people, the aborigines. We have recently been participating in the food dudes programme. In phase one, fresh fruit and vegetables were delivered to the school daily for us to taste. Now (in phase two) the children are preparing the fruit and vegetables at home and bringing it to school to earn certificates and rewards. 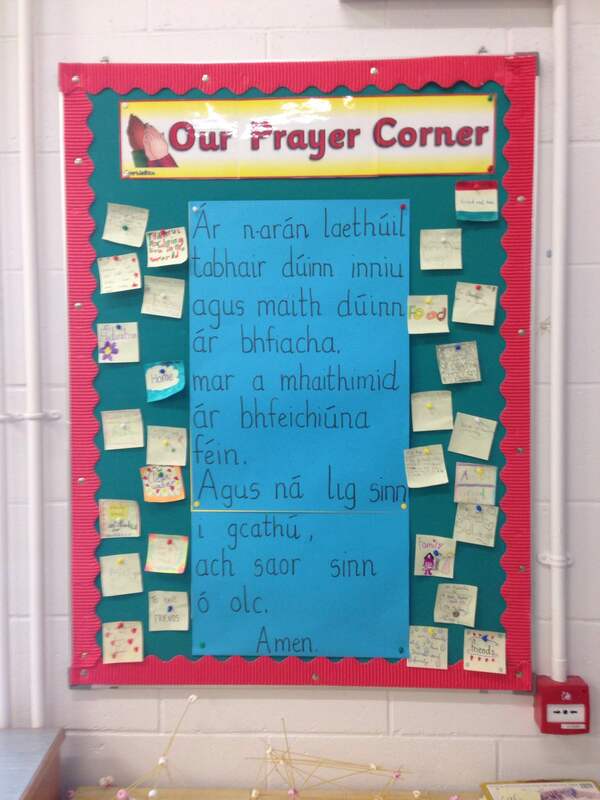 On the 1st of February, we celebrated St. Brigid’s Day. It is a special day because our parish church is named in honour of St.Brigid. We learned to sing and to play “A Song to Brigid” on the tin-whistle. Father Mc.Cormack visited the class for a short prayer service and the blessing of the crosses. Today Brendan Hayden and the Transition Year students from Coláiste Eoin took the senior classes for a coaching session. This will continue for six weeks. The 3rd and 4th classes in Ms. Moloneys room are currently following the PeerTutoring progamme. The children go to Mr. Keane’s to work in four groups for fifty minutes on a graded reading programme. Each pair of readers works together on the folllowing steps. Look at the name and cover of book. Look at the pictures in book. Five Questions you ask about what is going to happen. Close book and list 5 words you think you will meet in the passage. Summarise what you read orally. Did we find answers to our questions? Did any of the words we listed appear in the text? Put new words in sentence. What a fun day we had. We dressed up, carved pumpkins, played traditional Hallowe’en games and read with the skeletons and witches in Junior Infants. We can’t wait for next year already! This week, we studied Poland (the home of soccer player Robert Lewandowski, as well as other famous people). Click here to see the prezi presentation we created and to see what we learned. During Catholic schools week, we celebrated Grandparent’s Day. These are some of the cards we made. Artwork using lines and angles, inspired by Kandinsky. We captured photos of some of the birds we have been spotting. In the chilly weather, we have been making sure to keep our feathered friends well fed. South Africa is a country that is rich in culture and history. We have been studying topics such as the apartheid, Nelson Mandela, sport, animals, tribes, poaching, endangered species and much more. These are some of our projects. Paint and pastel drawings of the African plains. 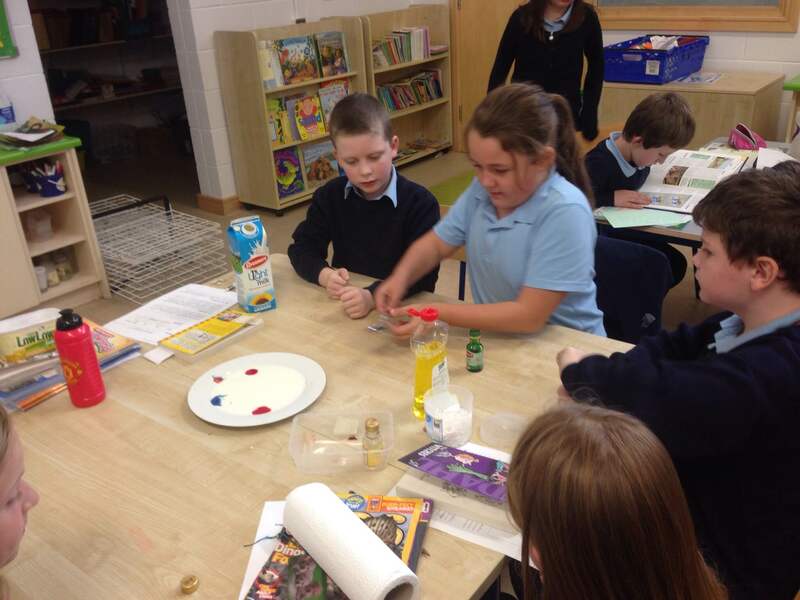 Thank you to dog’s trust Ireland for the recent educational visit to our school. We learned about how to care for dogs, how much exercise different breeds of dogs need daily, rehoming and what food dogs can and cannot eat. Did you know that chocolate, other dairy products, grapes, raisins and many other foods are harmful to dogs? We also learned about the new microchipping law that was recently brought in. All pups born since June 1 this year must be microchipped by the time they are 12 weeks old. At the end of the visit we got to pet the two beautiful dogs, having learned how to approach and pet them correctly (you should never approach a dog you don’t know, or pet one without asking an owner’s permission first). We also received wrist bands, stickers and a certificate to show what we had learned. Seo físeán den rang agus iad gléasta suas d’Oíche Shamhna. Tá siad ag déanamh an Haka Gaelach. An bhfuil eagla oraibh? Déan an nasc a chliceáil chun an damhsa a fheiceáil. Here’s a video of everyone dressed up for Hallowe’en doing the Haka ‘as gaeilge’. Click here to watch. 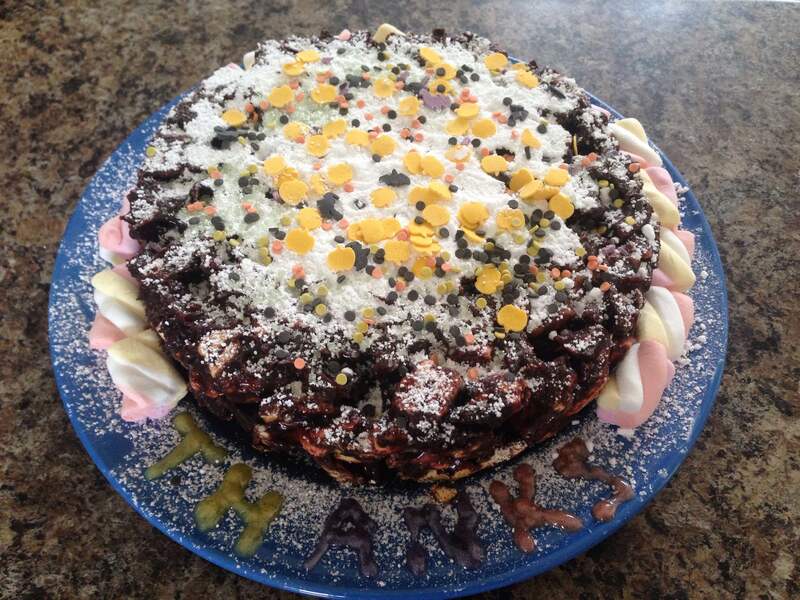 We decided to make an oreo and marshmallow chocolate biscuit cake. Firstly we up all the biscuits. Next, we measured the ingredients. Then we poured the biscuits into the mixture as we stirred the egg, butter and sugar mixture. After leaving the cake to set overnight, third class decorated it with icing sugar, marshmallows and some edible decorations. They did a really great job. Now it’s time to eat! This is a friendship chain. 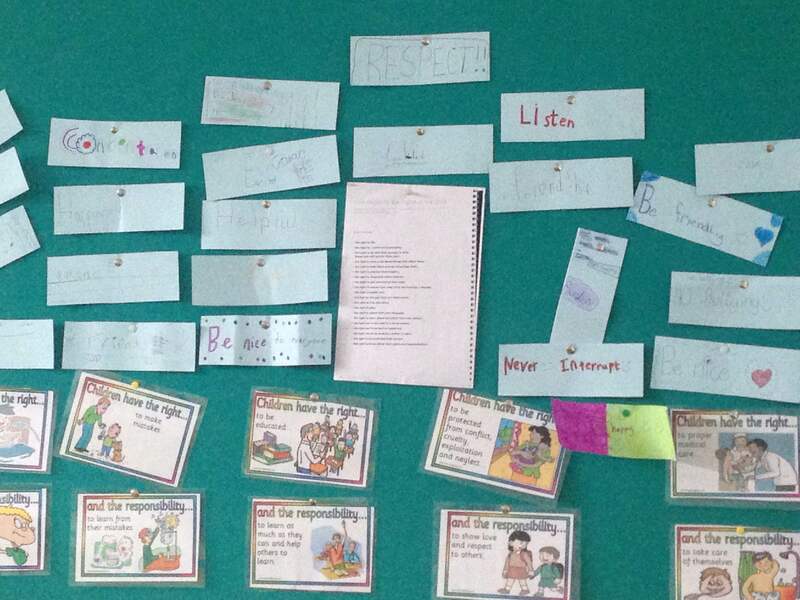 On it we wrote something nice about each child in the class and made a chain by attaching the slips together. 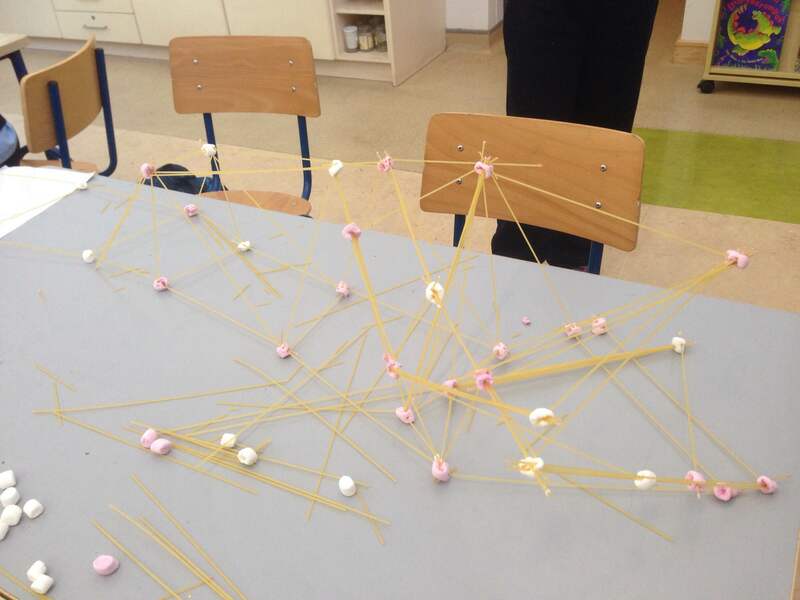 Using pasta and marshmallows, we created some interesting bridge designs. It was tricky at times to keep our structures upright but we managed to make some very creative pieces. 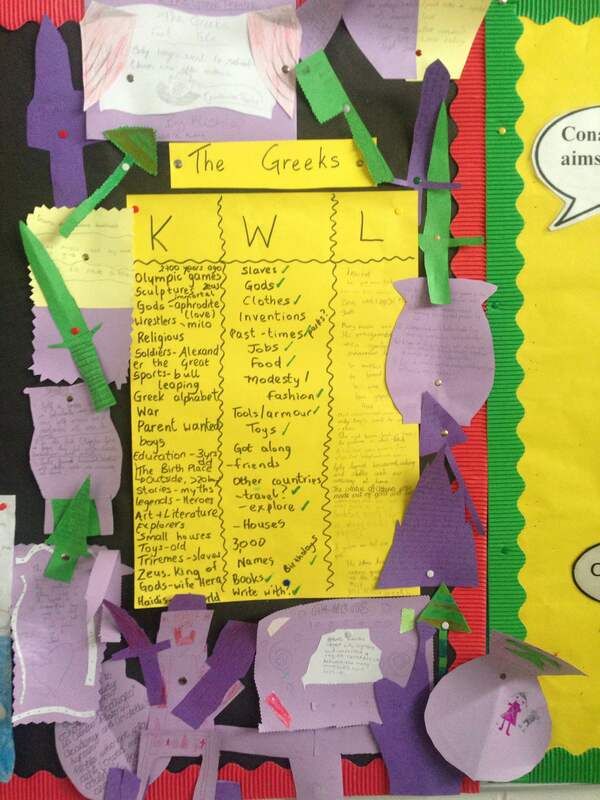 Before learning about the Greeks, we created a KWL chart. As you can see, we learned alot! 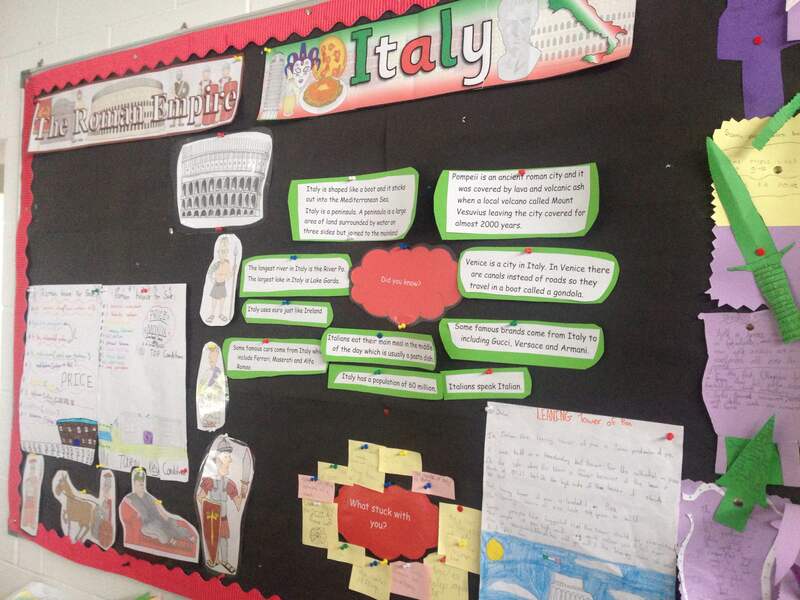 We have been learning about Italy and the Romans. These are some of the things we have added to our display so far. 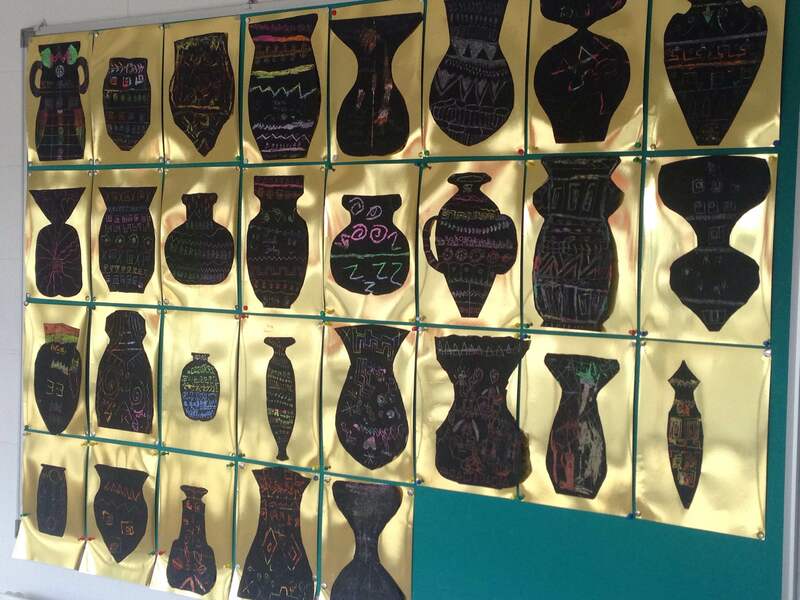 After learning about the Greeks, we designed Grecian styled pots using oil crayons and black paint. We used coins and pencil nibs to carve out the designs.